Pyongyang stages a new rocket engine test out of Sohae. On Sunday, North Korean state media said that Kim Jong-un presided over a ground jet test of a new rocket engine — a development that came as U.S. Secretary of State Rex Tillerson concluded his inaugural visit to China, where he discussed North Korea with his Chinese counterpart. According to KCNA, Kim Jong-un declared that the “whole world will soon witness what eventful significance the great victory won today carries.” Kim reportedly declared Saturday the day of the “March 18 revolution,” citing an advance of “historic significance” for North Korea’s indigenous rocket propulsion capabilities. 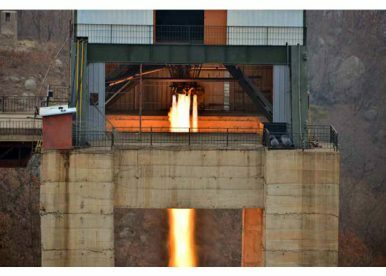 Sunday’s test took place at a static testing bed at the Sohae Satellite Launching Ground (also known as Tongchang-ri) in the country’s northwest, near the Chinese border. Last year, in February, North Korea launched the Kwangmyongsong-3 satellite launch vehicle from Sohae. The KCNA statement did not directly reference North Korea’s ballistic missile program or proffer any threatening rhetoric regarding South Korea or the United States as state media statements after prominent ballistic missile tests normally do. Pyongyang has long claimed that its satellite launch program is strictly civilian in nature, but advances in North Korean long-range propulsion knowhow through that program enable the country’s ballistic missile development. Sunday’s test comes amid talk earlier this year from North Korea that it could test an intercontinental ballistic missile — either its KN-08 or KN-14 — “anytime, anywhere.” Pyongyang has never flight tested an ICBM to date. In 2016, we saw two important tests of engines likely intended for North Korean ICBMs. In April, North Korean state media said the country had successful tested an engine that would “guarantee” its ability to strike the U.S. mainland with a nuclear warhead. That test came weeks after Pyongyang unveiled a photograph of Kim Jong-un standing by what was claimed to be a compact nuclear device suitable for mounting on a ballistic missile. In September 2016, days after its second nuclear test of 2016 and fifth nuclear test overall, North Korea showed off an 80-ton rocket booster, which was described as being intended for a “geo-stationary satellite” launch vehicle.